Chances are, if you aren’t stacking a fitness tracker alongside your watch/bangles/rainbow loom, you’ve seen people who are. And perhaps, you’ve asked those questions I commonly field about my FitBit. So, what’s the deal? Why are these things so popular and why do people want a buzzing, beeping, glowing band recording their every move? 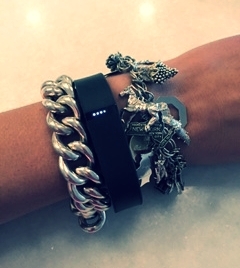 A recent article in Venture Beat predicts that almost 60 million fitness trackers will be in use by 2018. Wow. If you’re on board with a FitBit or Jawbone or Apple Watch, you’ve probably experienced some ups and downs – from the joy of setting an active-minutes record to the guilt of refreshing the app after a lazy day of watching playoffs. I’ve had these experiences with my FitBit Flex—feeling the literal buzz of hitting a goal and the despair of forgetting to recharge, going step-less for a day. So when friends and clients spy my FitBit and ask “does it work?” I usually say, yeeesss (unsure, drawn-out tone), and then meet their head tilt with an explanation. It works because it’s a constant reminder that I have health-centric goals and that I should make better, small decisions: get moving, be active, drink water, eat an apple. The daily goal to “get my steps in” means adopting more healthy habits in everyday life—like parking far-away, making multiple trips upstairs instead of one, walking around while on calls, and spending seven minutes on the elliptical when I get to the gym early, instead of zero. Wins beget wins, so if I hit my steps, why not keep it going and reach for carrots instead of pretzels? If you’re looking for a tool-- one of many to help you get to a point of sustainable wellness—I’d recommend a tracker. Keeping yourself in check by achieving daily goals is a powerful way to stay motivated. So, if you’re in the market, or thinking of getting on board, there are some amazing tracker comparisons available to help you choose the right mate. My favorite is this one from Gizmodo. And, if wearing a tracker isn’t for you, experiment with other tricks and tools to help you make better, smaller decisions for everyday health--- like putting healthy food in clear containers--front and center-- in your fridge, creating a mid-day calendar reminder to take a 10 minute power walk or sticking a post-it with a motivational/threatening/hilarious phrase on your alarm clock to jar you awake for the early am work out. It's the small stuff that translates into big changes.